House Speaker Nancy Pelosi has been pushing for a more robust public health care option. Washington (CNN) -- The battle over health care reform reached another milestone Thursday as top House Democrats unveiled sweeping legislation that includes a highly controversial public health insurance option. The nearly 2,000-page bill -- a combination of three versions passed by House committees -- would cost $894 billion over 10 years to extend insurance coverage to 36 million uncovered Americans, according to House Speaker Nancy Pelosi. However, the bill's total cost, including Medicare changes, is expected to be higher and could push the price tag over $1 trillion, according to an initial CNN analysis. 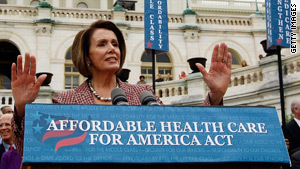 The bill guarantees that 96 percent of Americans have coverage, Pelosi stated. The claim is based on an analysis by the non-partisan Congressional Budget Office. Among other things, the bill would subsidize insurance for poorer Americans and create health insurance exchanges to make it easier for small groups and individuals to purchase coverage. It would also cap annual out-of-pocket expenses and prevent insurance companies from denying coverage for pre-existing conditions. Pelosi's office said the bill would cut the federal deficit by roughly $30 billion over the next decade. The measure is financed through a combination of a tax surcharge on wealthy Americans and spending constraints in Medicare and Medicaid. Specifically, individuals with annual incomes over $500,000, as well as families earning more than $1 million, would face a 5.4 percent income tax surcharge. Medicare expenditures would be cut by 1.3 percent annually. "Today, we are ... laying the foundation for a brighter future for generations to come," Pelosi said on Capitol Hill. "For Americans struggling with the cost of health care, this is an urgently needed bill," said House Majority Leader Steny Hoyer, D-Maryland. "This is an idea whose time has come." President Obama praised House Democrats for forging "a strong consensus that represents a historic step forward." Republicans tore into the bill, characterizing it as a series of tax increases and new regulations that would destroy jobs while doing little to stop spiraling health care costs. "This really is a government takeover of health care in America," said Rep. Mike Pence, R-Indiana. "It appears for all of the world like a massive government-run insurance plan paid for with a freight train of mandates and taxes and bureaucracy." Critics argue that the Democrats' $894 billion price tag excludes the cost associated with closing the Medicare "donut hole" prescription drug coverage gap. The donut hole refers to some drug costs left uncovered by Medicare before catastrophic coverage kicks in. Pelosi highlighted plans to close the gap while discussing the bill Thursday. Under the public option in the House plan, health care providers would be allowed to negotiate reimbursement rates with the federal government, according to Democratic leadership aides. Pelosi and other liberal Democrats had argued for a more "robust" public option that ties reimbursement rates for providers and hospitals to Medicare rates plus a 5 percent increase. Several Democrats representing rural areas, however, complained that doctors and hospitals in their districts would be shortchanged under such a formula. The Democratic leadership "pushed as hard as they could" for the robust option but couldn't win majority support for it, said liberal New York Rep. Jerrold Nadler. "There is no point crying over spilt milk." The House bill differs from legislation now being considered by the Senate in a number of critical ways. Senate Majority Leader Harry Reid, D-Nevada, also favors a public option but would allow individual states to opt out of the plan. Reid would allow for the creation of nonprofit health care cooperatives; the House bill does not include such a measure. A bill recently passed by the Senate Finance Committee does not include a tax surcharge on the wealthy but would instead impose a new tax on high-end health care policies, dubbed "Cadillac plans" by critics. A large number of House Democrats are adamantly opposed to taxing such policies, arguing that such a move would hurt union members who traded higher salaries for more generous benefits. Individuals under the $829 billion Senate Finance Committee plan would be required to purchase health insurance coverage or face a fine of up to $750. The House bill imposes a more stringent fine of up to 2.5 percent of an individual's income. Both versions include a hardship exemption for poorer Americans. The Senate Finance Committee bill would require large companies to contribute to the health care costs of lower income workers if those workers receive a government subsidy for insurance. The House legislation would require larger companies to provide employee insurance for everyone or pay a penalty of up to 8 percent of total revenue. Democratic leaders in both chambers agree on establishing nonprofit health care cooperatives and stripping insurance companies of an antitrust exemption that has been in place since the end of World War II. Moderate House Democrats, whose votes are needed to pass the bill, appeared to be cautiously optimistic. They didn't, however, offer any definitive judgments. "I'm not leaning one way or the other right now, but I just have to get into the bill and read it for myself," said Rep. Baron Hill, D-Indiana. "I'm hoping to be able to vote for it." The House Democratic leadership posted the bill online Thursday and agreed to give members at least 72 hours to read it before a vote. Under that timetable, the full House could begin debating the bill next week. Any bill passed by the House of Representatives will eventually have to be merged with legislation passed by the Senate. Both chambers would then have to pass a revised measure before sending it to Obama to be signed into law. One thorny issue remaining to be resolved among House Democrats is the final abortion language in the bill. Rep. Bart Stupak, D-Michigan, has been pushing leaders to add stronger language prohibiting the use of federal money to pay for abortions under new health care reforms. Stupak has vowed that if he isn't allowed a vote on the issue, a group of 40 anti-abortion Democrats will work to block the bill from getting to the House floor. Leadership aides admit that they need to find compromise wording on abortion but say they are confident the issue will be resolved by the time the bill gets to the floor.